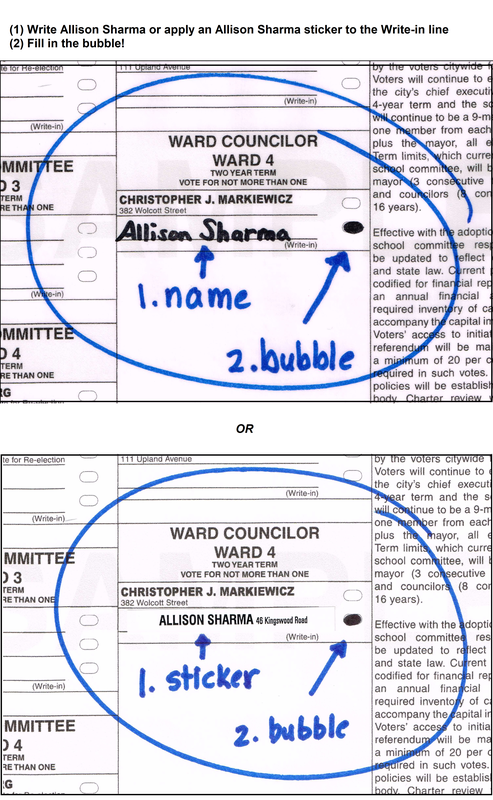 My name is Allison Sharma and I hope you will write me in as Ward 4 Councilor on November 7. I’ll work hard to make Newton a welcoming, diverse and vibrant city. Why am I running as a write-in candidate? Why won’t my name be on the ballot? Write-in candidacies are uncommon and I know there are questions about why I’ve taken this nontraditional path to run for City Council. I hope you’ll take the time to learn the story behind my candidacy – it’s why I was compelled to run in this unusual way and why I hope you’ll be compelled to take that extra step to write me in on November 7. On August 4, we in Ward 4 learned that our long-serving and respected ward councilor would not be running for reelection, effectively ‘opening’ a seat that had been held by an incumbent for years. The deadline for a candidate to submit papers to get his or her name on the ballot, however, had passed. It was too late for a new candidate to get on the ballot. Further, our incumbent quickly endorsed the one candidate who had submitted papers to be included on the ballot. There was concern in the community that my now-opponent was getting a ‘free ride’ to the city council. And there was a call for a write-in candidate to come forward so that Ward 4 would have a democratic, transparent, contested race. I was moved to answer that call. Ward 4 voters deserve a choice, and I’m running a write-in campaign to offer that choice.